Microsoft has only been in the PC system game for a few years now, but over the last couple of years they have made a lot of progress rather quickly. These days they have a solid foundation of products available, with the Surface Pro 4 being one of the best convertible tablets, the Surface Book being a very solid convertible laptop, and also the more specialized products like the Hololens, and Surface Hub. Going into their October 2016 event, the one missing piece of their PC product lineup was a desktop computer, but with the announcement and release of the Surface Studio, that particular gap has now been filled. But the Surface Studio is not your typical desktop PC. Even at first glance, the sleek, beautiful lines are readily apparent, and once powered on, it is rare for anyone to first glimpse the 28.125-inch 4500x3000 display and not say “wow”. It’s not only the very high resolution, but also the 3:2 aspect ratio that is unheard of in this segment, that makes the display stand out as something unique. 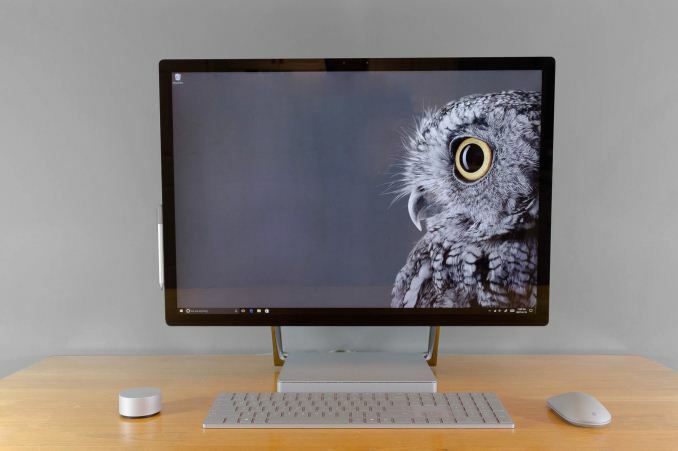 Microsoft has become one of the superlative hardware manufacturers in only the short span of four years or so, and the Surface Studio is one of their finest designs yet. 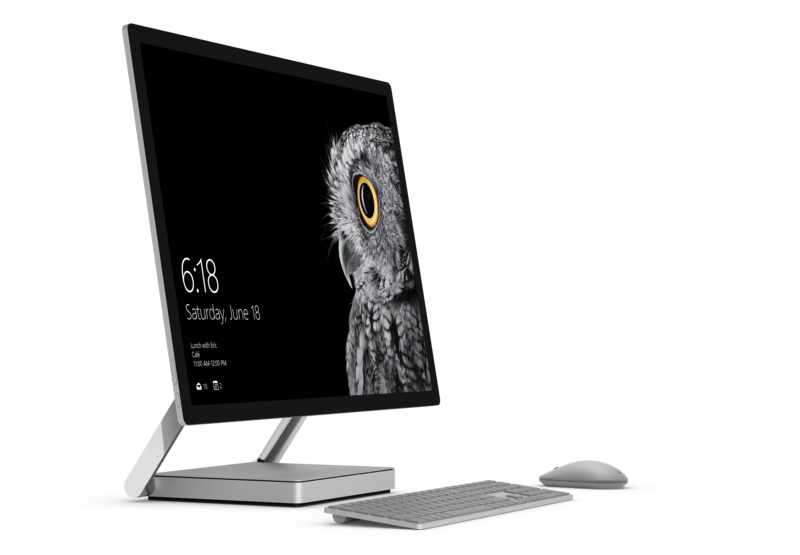 However, from the very first Surface RT, Microsoft always tries to add something different, but more importantly interesting, to their designs, and in the case of the Surface Studio, it is the zero-gravity hinge, which allows the all-in-one to be quickly and easily tilted back to a 20° angle, letting it be used as a huge, digital drafting table. Microsoft announced the Surface Studio at their October Windows event, where they also announced the next Windows 10 Update, called the Creator’s Update, and it is wonderful to see them building hardware to truly bring out the exclusive features of their software. Packed into the base of the Surface Studio is a laptop-class computer, with three different models available now. The base model, coming in at $2999, features an Intel Core i5-6440HQ processor, 8 GB of memory, a 1 TB hybrid drive with a 64 GB SSD cache, and a NVIDIA GeForce GTX 965M GPU. The mid-level model, which costs $3499, bumps the CPU up to an Intel Core i7-6820HQ, doubles the RAM to 16 GB, and doubles the SSD cache to a PCIe 128 GB model, with the same 1 TB HDD and GTX 965M. The highest priced model, at $4199, is an Intel Core i7-6820HQ, 32 GB of RAM, a 2 TB hybrid drive with a 128 GB PCIe cache, and a NVIDIA GTX 980M GPU with 4 GB of memory. There was quite a bit of discussion at the time of the Surface Studio launch over the fact that it was equipped with older technology. Intel’s Kaby Lake quad-core parts just launched at CES this year, so Skylake quad-core CPUs were the latest generation available at launch. The Maxwell based graphics options chosen were not the latest generation mobile graphics from NVIDIA, with the GTX 965M and GTX 980M available in the Studio. The Pascal based GTX 1060 and GTX 1070 would have been much more powerful substitutes, but they are not pin-compatible drop-in components with the Maxwell GPUs in the Surface Studio, meaning a new board design and thermal considerations would have been necessary late in the design phase, and Microsoft appears to have been conservative here to avoid missing their launch window. Microsoft has also been very conservative with their I/O choices, with four USB 3.0 Type-A ports on the back of the Studio, along with a SD card slot, and mini DisplayPort. As with the Surface Pro 4 and Surface Book, Microsoft has continued to provide only the older USB-A ports, and not even offer a single USB-C port, let alone with Thunderbolt. Anyone purchasing a Studio will likely be using it for several years, and the lack of USB-C is going to be an issue in the future, if not already today. The Surface team really needs to reconsider this as it is already a detriment to not include any. There also must be some questions raised about the use of a hybrid drive in a PC of this price. We’ll dig in to the experience later, but Microsoft could and should offer a larger SSD as the boot disk, complimented by a HDD as a secondary disk, at least on the highest end model. A 512 GB NVMe SSD as the boot drive would appease much of the criticism. The computer does cost over $4000 after all, and while much of the cost of the device is in the display, SSDs have been the biggest improvement in user experience on the PC in a long time. That's a shame. I would've hoped it would behave more like the Surface Book given the same software and similarities in the hardware. I haven't had any issues with my Surface Book thus far that weren't a result of my own software and configuration choices. No lockups at all to this date. Some quirky behavior with Edge early on that got fixed with updates (All Win10 devices?). Abnormal pauses were reproducible on a desktop Win10 system and I've adjusted my configuration to eliminate this issue on both. Games work well enough despite not getting the latest nVidia drivers. My uncle said he had some issues with his early on, but it didn't take them long to resolve them. In my experience, Surface Pro 3 is much more stable platform than Surface Pro 4. Had a chance to use both, actually switch between SP3 and SP4 a few times. On paper, SP4 would be my choice - less heat, less fan activity, slightly bigger, better, higher res screen... a bit lighter, too.